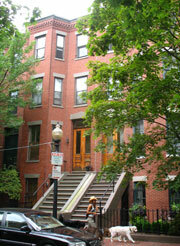 Boston's South End neighborhood has relatively few historic sites. 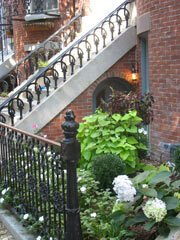 But if you love Victorian architecture, contemporary art, chef-owned restaurants, and unique shops, put this ultra-chic but homey Boston neighborhood near the top on your must visit list. Not only does the South End boast the largest area of Victorian brick row houses in the United States, as listed in the National Register of Historic Places, but most of this real estate has been lovingly restored during the past 30-40 years. You'll find street after street filled with stately residences, one more dazzling than the next. Adding to their charm, many cluster around small parks modeled after London squares. Architecture fans will have fun spotting all the different styles: Italianate and French Second Empire, Renaissance Revival, Greek Revival, Egyptian Revival, Gothic Revival, Queen Anne, and in the late 19th century houses near the Southwest Corridor, even hints of Eastlake Gothic. You could write a book just on the variety of ornate iron railings in the neighborhood. Many of these homes cluster around small London-style parks and squares, while others line the Parisian-inspired boulevard, Columbus Avenue. 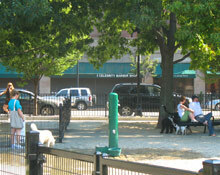 All together, the neighborhood has about 30 parks, including one dedicated to dogs (and their devoted human companions). 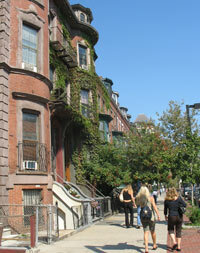 On the southern end of the neighborhood - now called SoWa, as in South of Washington (Street) - artists' studios and galleries fill former commercial buildings, particularly along Harrison Avenue and Albany Street. Although rents are no longer inexpensive in Boston's South End, a thriving arts community flourishes, anchored by the Boston Center for the Arts and its Cyclorama. Special art events such as the First Friday Open Studios, South End Open Studios, and SoWa Open Market draw crowds of art lovers and shoppers from far beyond the neighborhood. Long-time South End residents will tell you that a single moment in recent history marks the point when they knew that their then-gentrifying neighborhood, called "developing" for years, would soar to new heights. That "moment" actually took place on a day in 1987 when popular Boston chef Gordon Hamersley opened Hamersley's Bistro on Tremont Street. Following Hamersley's lead on two counts - locating in Boston's South End, plus using fresh, local ingredients for innovative cuisine - numerous restaurants, cafes, and bistros make the neighborhood an irresistible magnet for foodies. The only difficulty is deciding where to eat. Approximately 30 independent restaurants run by outstanding chefs/owners now flourish in the neighborhood. Unique and tempting shops also pop up along the main commercial streets - Tremont, Washington, Harrison, Shawmut, East Berkeley, Albany, and Clarendon. High-end home furnishings and decor, trendy fashions, gourmet food shops, antiques, jewelry, bookstores, and even luxury boutiques for sophisticated dogs make this area a shoppers' playground. Why is Boston's South End is called the "South End"? The area got its name because of its original location south of the narrow isthmus then called Boston Neck. Before Boston started expanding through landfill, Boston Neck connected the peninsula containing Downtown Boston and other Boston Proper neighborhoods to the mainland. In 1829, the City of Boston began to create more land by filling areas on both sides of the Neck, a process that continued for the next couple of decades. To encourage Yankees to remain in Boston in large enough numbers to out-number and out-vote the Irish immigrants pouring into the city in the late 1840s, Boston began promoting the South End as an upper-middle class neighborhood. During the 1850s, the City laid out streets and boulevards with attractive parks and squares, planted trees, and as an special enticement, laid sewers. And this development plan worked . . . briefly. Wealthy merchants and businessmen built the large, elegant brownstones and red brick row houses with bow fronts and cast ironwork that you see today. But by the close of the 1860s, the South End's desirability ended abruptly - doomed by newer, cheaper housing along Columbus Ave that made the area seem less exclusive . . . and by the growing prestige of spectacular Back Bay rising up from even more recently created land to the west of the Public Garden. Seemingly overnight - but actually within less than a decade - bank foreclosures eroded property values, waves upon waves of immigrants moved into the suddenly cheap housing, and magnificent homes morphed into chopped up rooming houses. A hundred years later, Boston's South End continued to be riddled by poverty, crime, arson, and drugs, yet it was also home to communities of low income residents. By the 1960s, an ambitious redevelopment plan threatened to slash through the South End and other Boston neighborhoods in order to create a 12-lane highway connecting Downtown Boston to the southwestern side of Route 128 (Interstate 95). Spurred on by the specter of the destruction of Boston's West End neighborhood and the displacement of most of the residents a decade earlier, community activists fought against the Southwest Corridor Expressway throughout the 1960s. Finally, in 1972, Governor Francis Sargent halted the project, citing higher costs than benefits, and particularly "the impacts that construction of these facilities would have had upon the social, economic and environmental impact of the region." Instead, the City built the T's Orange Line underground where the highway had been planned to - a totally accidental but nonetheless wise green decision. Today, you can enjoy the lovely result of this failed effort: the Southwest Corridor Park. Just north of Columbus Ave, this 4.7-mile, 52 acre linear park links Boston's South End with Forest Hills in the West Roxbury neighborhood. 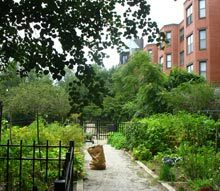 The 1-mile stretch through the South End is perfect for strolling, enjoying the gardens, and reading some or all of the 18 poems and stories by local writers etched into pillars and granite slabs along the way. Happily, the failure of the "redevelopment" effort paved the way for the renaissance of Boston's South End neighborhood. Even before the highway plan died, the public attention focused on this blighted but once beautiful area caused intrepid renovation pioneers to realize: this neighborhood could bloom again! The sound of renovations began to fill the air in the 1970s, reaching a crescendo by the 1990s. The "gentrification" process sparked mixed emotions as high income newcomers pushed out many long-time low income residents. Especially during the 1980s, the start and stop nature of the process caused many skeptics to question the neighborhood's economic viability. A boost came in 1983, when the 500-acre area area became a Boston Landmark District. As you explore the once-again beautiful South End of today, you'll wonder why anyone ever questioned its rebirth. 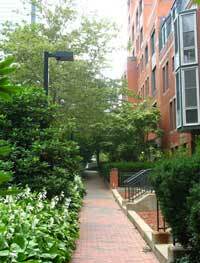 Like elsewhere in the city, the best way to explore Boston's South End is on foot. A good place to start is at Back Bay Station on Dartmouth Street. Facing Copley Place, you'll see the beginning of the Southwest Corridor Park just to the left. Cross Dartmouth carefully, and stroll down the Corridor. Although the gardens along the pathway through the park are lovely, you'll also find yourself peering at the stately rows of Victorians on your left. During the summer, you may have a tough time seeing these gorgeous homes because of all the large leafy trees. You'll feel tempted to turn down one of the side streets, and can do so at any time. West Newton Street is a good option . 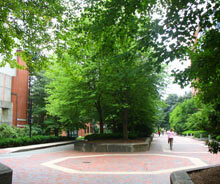 . . or continue strolling along the Corridor to West Springfield, the street before Mass Ave, and then turn left. Wandering around more or less aimlessly is actually the best way to experience the South End. However, if you want to explore shops and restaurants, you'll find most of them along the major east-west streets and avenues: Columbus, Tremont, Shawmut, Washington, and Harrison (plus you'll find some of the newest arrivals on Albany). 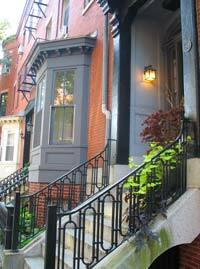 To view the neighborhood's rich architectural treasures . . . well, almost any side street will do! 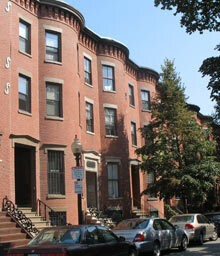 Especially lovely are the bow-front houses on Claremont Park (north of Columbus, 2 blocks east of Mass Ave), Rutland Square (between Columbus and Tremont), and Union Park (between Tremont and Shawmut). If you're a dog lover, be sure to stop by the Joe Wex Dog Recreation Space in Peters Park between Shawmut and Washington, near East Berkeley. Even if your dog isn't with you, you'll smile at the happiness of the dogs and humans playing there. You'll also want to catch the South End's Annual Halloween Pet Parade, when dogs dress up in their favorite ghoulish costumes and parade from the South End to Boston Common to celebrate the holiday. One can only sightsee on foot so far. Then one is well-advised to sit and observe, preferably with refreshments . 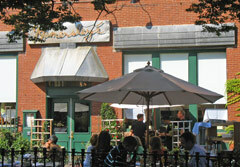 . . and in Boston's South End, you'll have your pick of great places for people-watching. Three ideal people-watching spots: the wine bar at The Butcher Shop (552 Tremont), the sleek chrome oyster bar next door at B and G Oysters (550 Tremont), and when the weather is warm, an outside table at Picco (513 Tremont) across the street. Are you wondering if all of the South End's restaurants are clustered in one spot on Tremont Street? Not to worry - you'll find many other tempting restaurants, bistros, and bars, plus one of the city's best gourmet cheese shops as well as other specialty food markets, generously sprinkled throughout the neighborhood. If you're drawn to Boston's South End by art, time your visit to correspond with the first Friday of the month. The enormously popular First Friday Open Studios occur monthly from 5 - 10pm at the SoWa Artists Guild at 450 Harrison Ave.
You'll find many other artists' studios along this stretch of Harrison Ave, as well as scattered throughout the rest of the neighborhood. The Bernard Toale Gallery (450 Harrison Ave, 617-482-2477) features new and emerging artists working in a variety of mediums. The Berenberg Gallery (4 Clarendon St, 617-536-0800) showcases self-taught and "outsider" artists - the only Boston area gallery to focus in this area. 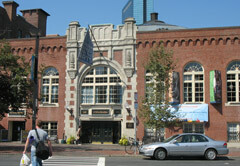 Another not-to-be-missed spot is the Boston Center for the Arts (539 Tremont). In addition to artists' studios and an art gallery, the BCA complex includes 4 performance stages, including the Stanford Calderwood Pavilion, and the Boston Ballet's rehearsal space and offices. The Mills Gallery within the BCA features emerging artists. The BCA's restrooms won a design aware in 1993 - so stop in to admire. The centerpiece of the BCA is the Cyclorama, a round, domed building that opened in 1884 to exhibit an circular 50 feet by 400 feet painting, The Battle of Gettysburg, by French painter Paul Philippoteaux. The huge popularity of the equally huge painting caused it to be moved 5 years later to the Gettysburg National Historic Park. The space is now used for exhibitions and performances. The largest Roman Catholic church in Massachusetts, the Cathedral of the Holy Cross, is at Union Park Street and Washington Street. Built in 1875 from Roxbury puddenstone, Quincy granite, and brick, it features stained glass from Munich, and a magnificent Hook and Hastings organ considered among the best liturgical instruments in the city. Architecture enthusiasts will want to go see the Allen House at 1682 Washington Street. Built in 1859, this is one of Boston's most ornate Victorian townhouses. 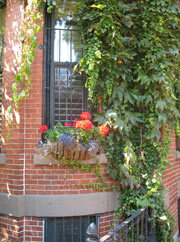 In particular, check out the elaborate brownstone carving. One block away, you'll find the William Porter House (1724 Washington). The 1806-1807 Federal-style structure is actually 2 houses, mirror images of each other, and they are the oldest surviving houses in the South End. A magnificent bronze sculpture in the newly renovated Harriet Tubman Park at Columbus Ave and West Newton Street honors escaped slave Harriet Tubman. Although Tubman did not live in Boston's South End, she actively supported the city's Underground Railroad and later established one of her settlement houses in the South End. The New Harriet Tubman House at 566 Columbus Ave, the headquarters of United South End Settlements, includes a resource center with books, letters, articles, and multi-media material about her life. Martin Luther King, Jr., who resided in the apartment building at 397 Mass Ave while studying theology at Boston University. He started dating Coretta Scott, his future wife, while living here. Future poet (The Prophet) and artist Kahlil Gibran, who immigrated to the United States from Lebanon in 1885 at age 12 and lived for almost 10 years in Boston's South End, then the 2nd largest Lebanese-American community in the country. Benjamin Franklin . . . well, he didn't actually live here but he left his hometown, Boston, money in his will to establish an institute of practical learning. Now affiliated with Boston University, the Franklin Institute at the corner of Berkeley and Appleton teaches applied engineering. When far-sighted renovators began buying and fixing up homes in Boston's South End several decades ago, most of these urban pioneers were either single, childless, or the parents of adult children. Walk around the neighborhood on any random sunny afternoon, stop by a neighborhood park, drop into a restaurant or an art gallery, and you'll see . . .
And not just a few, but lots of them! You'll even see adorable shops with names like Tadpole (37 Clarendon Street, 617-778-1788), full of irresistible, super-cool toys and clothes for babies and kids. So what has struck the previously mostly-adult South End? Apparently, a baby boom! And why not? The neighborhood's spacious houses and condos are perfect for raising families. The numerous tree-filled parks provide plenty of places to play. And the community-oriented spirit qualifies the South End as a "village" . . . which we all know is helpful when raising children. Most important, this friendly and welcoming neighborhood is laying the groundwork for future generations. Boston's South End is located south of Back Bay and Bay Village. Surrounding boundaries include the Southwest Corridor Park (just north of Columbus Ave) on the north, East Berkeley - or is it the Mass Pike? - on the east, Harrison Street on the south, and Mass Ave on the west. But these are only "suggestions" - and as you'll see, not everyone agrees that they're correct. As this area grows in popularity (and already-expensive properties become even hotter), boundary creep expands the neighborhood - particularly around Boston Medical Center, where Albany Street is becoming the new southern border, and to the east, where the Pike has probably already replaced East Berkeley as the eastern edge. Maybe the northern border is actually Huntington Ave? 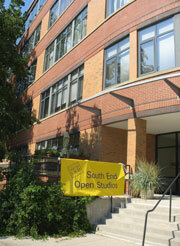 Within the South End, the super-trendy SoWa (south of Washington) area is, well, the area south of Washington Street. Closest T Lines/Stations: Orange Line/Back Bay. As you leave the station, head to the left down Dartmouth Street for a block. Once you cross Columbus Ave, you're in the South End. 500 and 540 Harrison Ave. Occasionally offers free parking for special South End events. Under the Calderwood Pavilion at the Boston Center for the Arts. Enter on Warren Ave, at the back of the facility. On-street parking is mostly "South End Residents Only." Driving and parking in Boston's South End, like most other areas of the city, can be difficult and is not recommended. In any case, you'll have the best experience in this neighborhood on foot.